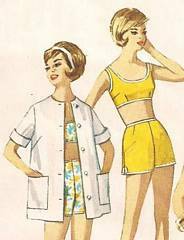 Original vintage sewing pattern for front buttoned straight dress and shirt, lined bra top and shorts. 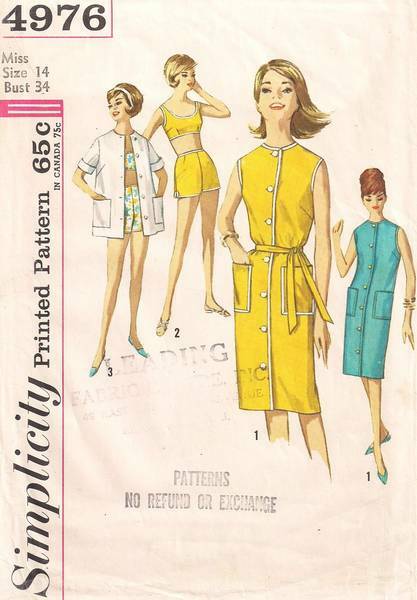 The sleeveless dress, which buttons down the entire front, may be top stitched or have braid trim. Optional tie belt. The bra has low, round neckline in the front and back and three buttons in the back for closing. Shorts have side zipper and side slits. The shirt has roll-up sleeves and large patch pockets. 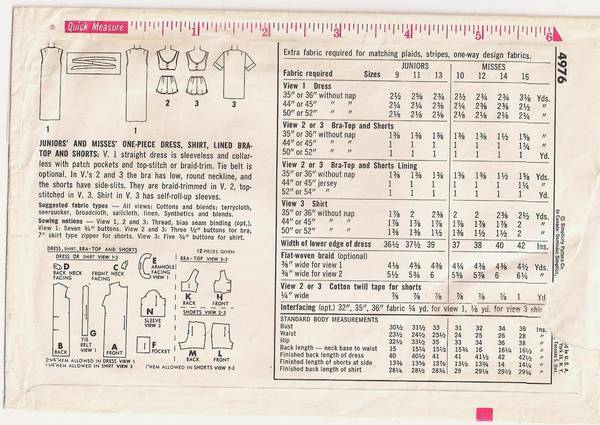 Size 14, Bust 34, Waist 26, Hip 36. The pattern is complete with only the shorts and bra pieces cut. Envelope is in good condition; small chunk torn on the back (see additional image below) but it does not affect any of the pertinent information.